Siri Shortcuts in an app created by Apple, which can be used to create amazingly useful shortcuts. The app can be downloaded from the App Store for free, as long as your device is running iOS 12 or above. The Shortcuts app makes it easy to simplify otherwise long or tedious tasks by completing an unlimited number of actions with the tap of a button. While anyone can create their own shortcuts relatively easily, more advanced users have come up with some very impressive shortcuts and made them available to download. This article will cover 5 shortcuts which I believe to be very useful. Starting off with quite a simple one, these shortcuts do exactly what it says on the tin. Since control centre was updated in iOS 11, the standard Wi-Fi and Bluetooth toggles don’t actually turn their respective settings off. Instead, they simply disconnect from networks temporarily, which doesn’t do anything for saving battery life. These shortcuts can be used to regain full on and off toggles without the need to go into the settings application. Getting into the more interesting shortcuts, this one allows you to quickly produce a QR code which can be scanned by another device wanting to join your Wi-Fi network. Simply tap the shortcut within the shortcuts app or the widget, and a QR code will be generated. This will allow another device to connect to your network without needing to reveal your password, not to mention it’s much quicker than typing it. Unfortunately, it will only work with one network, as the password needs to be entered into a text field within the shortcut, but for most people that should be all you need. If you’re the kind of person who uses Amazon to buy almost everything, this will be a very useful one for you. 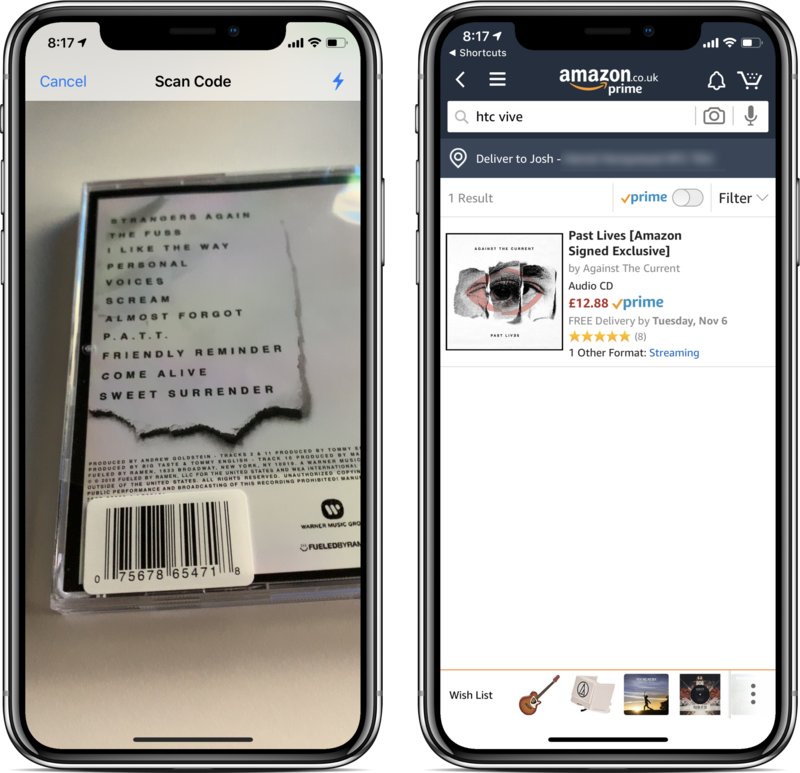 Activating this shortcut will bring up the camera, allowing you to scan the barcode of any item to be searched for on Amazon. Leaving everything default in this shortcut will mean it only works in the US, but simply by changing ‘.com’ to your countries Amazon domain (e.g. ‘.co.uk’), you can make it work with whichever country you’re in. 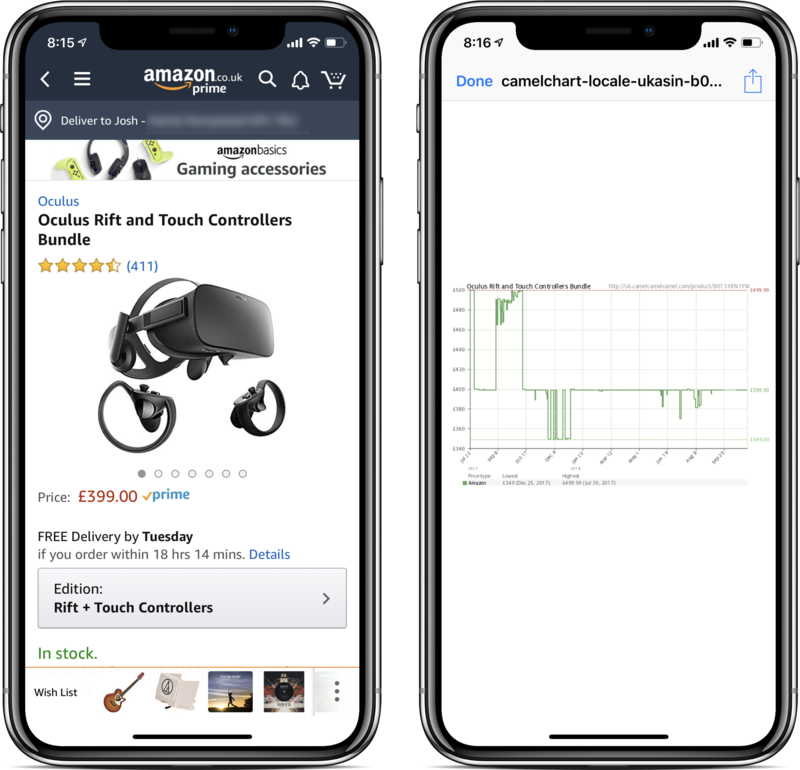 This one goes hand-in-hand with the last one and allows you to quickly view the price history of any item on Amazon. Simply go to the share button on any Amazon product page, tap shortcuts, then select the Amazon Price History shortcut. This will produce a graph showing the price history of the item, as well as maximum and minimum prices since the item was added. Another shortcut that does exactly what it does on the tin. This shortcut allows to you quickly turn any burst photo into an animated GIF image. While there may be apps available on the app store that can do this, none are as simple as using this shortcut. Simply activate the shortcut, select the burst image you want to convert into a GIF, and it will be generated. Once you’ve viewed it, you got the option to share or save it if you like it. As more shortcuts are created, so will more of these articles so make sure to follow me on social media to be notified when they’re live [Twitter | Facebook]. If there are any shortcuts you think should be featured, make sure to comment with them below.